Since 1878 Stockholm University has been characterized by openness and innovation. The main part of Stockholm University is in the area Frescati, ranging from Bergius Botanical Garden in the north to Sveaplan in the south. It is located in the world’s first national urban park and the area is characterized by nature, architecture and modern art. Within Frescati, the areas Albano (Stockholm), Bergius Botanical Garden, Frescati Backe, Frescati Hage, Kräftriket, Lilla Frescati and Sveaplan are located. A modern university with a multicultural environment, Stockholm University is one of the world’s top 100 higher education institutes. 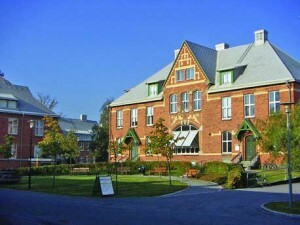 Stockholm University has two scientific fields: the natural sciences and the humanities/social sciences. It has over 66,000 students at four different faculties: law, humanities, the mathematical and natural sciences making it one of the largest universities in Scandinavian countries. The University contributes to individual and social change through top quality education and outstanding research. SU researchers contribute to the development of public policy and political decision making, and participate in Nobel Prize Committees and international expert bodies. Stockholm University was granted university status in 1960 and is therefore the fourth oldest Swedish university. Since 1970 most of the university operations are pursued at the main campus at Frescati north of the city center. Its primary mission is to provide education and high quality research and to interact with the community. Stockholm University is a state agency and is governed by the decisions coming from the government and parliament. The University has the right, within the limits the government provides, to decide on many issues such as their internal organization, educational, admission of students and more. The University Board is the University’s highest governing body. The board is responsible for the University as a government agency’s mission and for following the requirements of laws and regulations. The board reports to the government. It consists of eight external members (including the Chairman and Vice-Chairman), four business representatives from the university with two group alternates and three student representatives (one graduate student representative) with an alternate. The University board is above the principal who is the head of the authority and have operational responsibility for all operations. The principal has a vice president to replace him/her if necessary. At the university, there are two area councils, Area board of science and Area board of humanities, law and social sciences. They are headed by a vice principal. The area boards are responsible for strategic planning of education and research, coordination of faculty teaching, research and internal and external collaboration. The University administration is the preparation and service organization for the University board, principals and other decision-making bodies, and it is led by the executive director. The University administration has a number of administrative units in charge of different parts of the university administration, for example, finance department, IT department, HR department and the student section. There are also three staff units: the strategy, planning and communication unit that will help the university management with decision making. Education and research at Stockholm University is carried out within the natural sciences and the humanities/social sciences. Within these fields, there are four faculties with 70 departments, institutes and centers within the humanities, law, natural sciences and social sciences. Research and training also takes place at a number of centers and institutes with a separate governing board, but that organizationally belong to a department. There are 200 Bachelor’s programmes and 1,900 courses to choose from. The university researchers engage in governmental investigations participates in the media, leaving comments on proposed legislation and is included in several Nobel committees and international expert bodies. Prior to 2008, Stockholm University had only one student union called Stockholm University Student Union. However as of 2008 the computer and system science students and the teacher students have their own, independent, student unions called DISK and “The Teacher’s College’s Student Union”. The law students also have their own student union, as do journalism students. The future of the Teacher’s College’s Student Union is however not entirely safe, as Stockholm University’s Student Union has declared it will begin talks with the Teacher’s College’s Student Union on transferring its members to it, as it already has a teacher’s division In contrast to common belief DISK does not stand for anything. There are many ways to get to Stockholm University; the main campus Frescati is located near the underground railway station Universitetet metro station, on the red line of the Stockholm Metro. The commuter train line Roslagsbanan also stop close to the main campus, at Universitetet railway station. SL buses 40, 70, 540, 608 and 670 can also be used to get to the campus. The Computer Science campus, Kista, also is close to an underground station called Kista. It is also located close to the pendeltåg station Helenelund, only 1-2 stops (depending on bus line) from the bus station Torsnäsgatan located next to the campus area. The Teacher Students campus is located next to the underground station Thorildsplan. Stockholm is a cultural hub and economic centre, with many green areas and surrounded by water, making it an ideal place in which to enjoy a relaxed and exciting student life. The University offers a wide range of scholarships for international students, from partial free awards to full scholarships covering fees, maintenance grants and other allowances. It is important to make enquiries and apply for sources of funding as early as you can. For further information please visit: http://www.su.se/english/.